"I teach a couponing class," she says. From there my thoughts got a little out of control. How much does a couponing class cost? More than the amount you save by using coupons perhaps? Is there a coupon for said couponing class? How did this woman score this gig as I stared at my college diploma while serving tables for a year after graduation? Does one major in couponing at some community colleges now? With a minor in daytime game show auditioning, maybe? Can you not find all of this information on the internet? This. And lastly, is it really necessary to enroll in a class to teach you something that Honey Boo Boo's mom has already mastered? So this is what happens when I watch tv all day. I hope you're not a couponing class teacher, but if you are, feel free to answer any and all of the above questions. I'm genuinely interested. 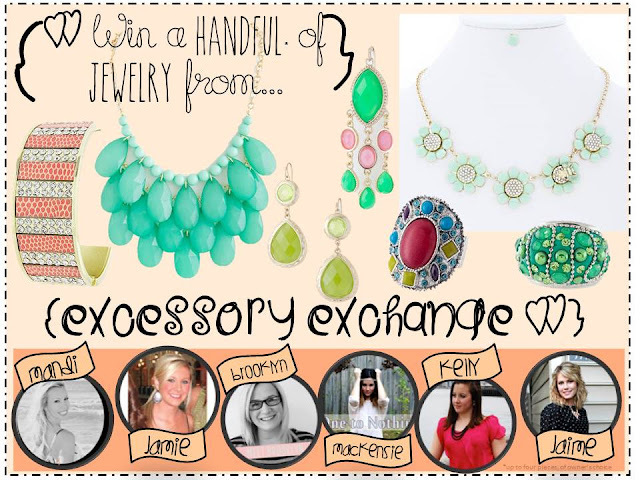 And even if you're not, check out these lovely pieces of jewelry from Excessory Exchange and enter to win them below. Let me know when you get those answers! I would hope you'd save more than you'd spend to take the class! man those extreme couponers are crazy!!!! but impressive at the same time. Ha this post made me laugh! Those yellow earrings are too cute! That's interesting.. I hope that the coupon class has a coupon for a discounted rate! Man, even if I took a couponing class, I'm so scatter brained I probably wouldn't stick with it for more than a week! i tried to coupon once. even got a binder. and then i failed. that was a terrible story.